An election season is the most entertaining time of the year in India. Politics here is a microcosmic reflection of the colourful grand panorama that Indian civilisation is. From Lalu Prasad Yadav to Rahul Gandhi, our politicians cover every shade of humour, satire and eccentricity. No wonder, politics in India is a satirist’s delight. 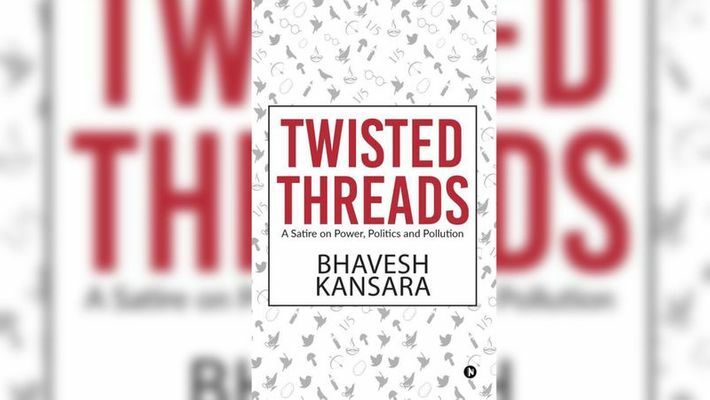 No one else uses satire to such a devastating effect as Bhavesh Kansara does in his book Twisted Threads. What started off as ‘twisted threads’ on Twitter has now taken the shape of a book, such is the power of social media today! I got hooked on to Kansara’s handle @mekansara, when someone in a WhatsApp group posted his hilarious thread on Rahul Gandhi’s funny statement on connecting MRI machines. The book begins with an amazing foreword by Manmadam Singh. Only those who have read the foreword will understand why. Bhavesh Kansara rivals JK Rowling in choosing wickedly witty names and acronyms like in the Harry Potter series — Chikram Vandra, Sankhya Sifar, Prakash Nakuchkar, Sitasurya Chammach, Kudratey Schuer and MEMRI (Ministry for Establishing MRIs). It will leave you in splits when you discover the real life personalities being trolled. No one is spared the sharp cuts of Kansara’s witty pen, including She Who Shall Not Be Named — in contrast to the mainstream media which obeys the Omerta code when it comes to reporting about her. The book is largely based on real-life events. It is this close connection to reality which makes the satire thought provoking; for it is a commentary on the warped and perverted state of minds of a section of our politicians, judiciary, intellectual elite, activists and journalists who live in the proverbial ivory towers. The book covers every issue of national concern and many recent controversies. The author’s grasp over current affairs is commendable. However, this poses a difficulty for the lay reader. Unless one is familiar with the issues and is able to connect the pseudonyms used to their real-life avatars, one might easily miss the point. Perhaps, the author could provide some clues at the end of the book in a creative way with some relevant news clips, which can give us pointers to the plot. The so-called right wing in India has often been accused of taking things too seriously and being devoid of humour. Chetan Bhagat went to the extent of doing a psychoanalysis of ‘bhakts’ (and I hope that there will be a twisted thread on ‘Bhetan Chagat’soon!). Bhavesh Kansara’s book represents a refreshing change that fills this vacuum.